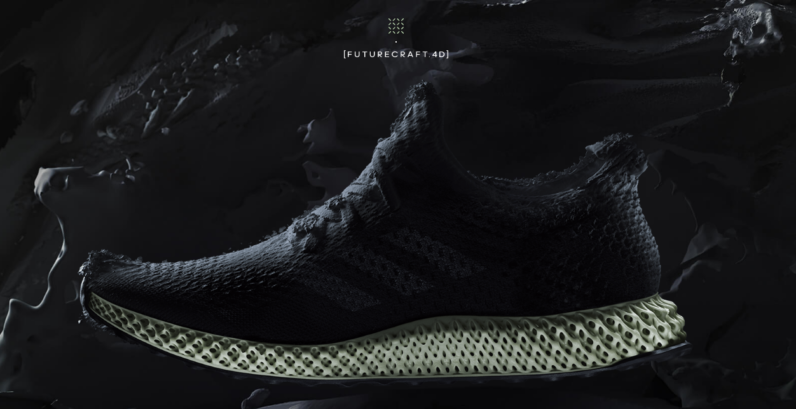 Sneaker manufacturers have been toying around with 3D printing for some time, but now Adidas wants to push the technology forth to the masses with its latest kicks – the Futurecraft 4D. The sneakers will be produced in collaboration with startup Carbon 3D using a method better known as ‘Continuous Liquid Interface Production’ which ultimately relies on ultraviolet light for the 3D printing process. The Silicon Valley 3D-printing startup claims that – in addition to producing more robust final materials – the approach also significantly speeds up the overall manufacturing cycle. The most noteworthy advantage of using Continuous Liquid Interface is that it allows for a more tailored approach to making sneakers. Still, the technology has a long way to go before it becomes financially viable to offer more customization options to consumers. This is hardly the first time Adidas has experienced with 3D printing. A few years back, the German shoemaker released a limited batch of 3D-printed shoes. Now it wants to take this initiative to the next level. While the company will put out 5,000 Futurecraft pairs for sale later this year, it aims to produce a total of 100,000 by the end of next year. Go check out the Futurecraft 4D’s in more detail on this page, where you can also sign up for all future updates about the sneakers.